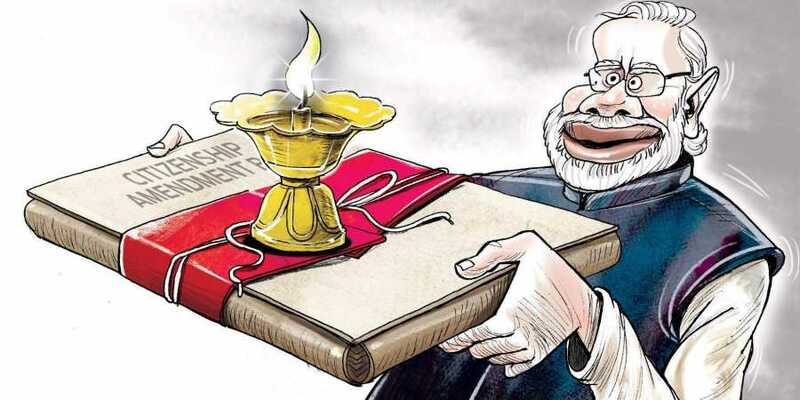 The PM was promoting the Citizenship Amendment Bill, which entails giving citizenship to non-Muslims from Bangladesh who crossed over to India. The Bill faces opposition across the Northeast, whose original residents, whatever their religion, have long feared being swamped by Bangladeshi immigrants. Indeed, the long, painful process (40 suicides already) of drawing up the National Register of Citizens (NRC) in Assam, addresses these fears by aiming to deny citizenship to Bangladeshis who entered India after March 1971. This aim is in direct opposition to the Citizenship Bill, yet, the PM’s party president has repeatedly hailed the NRC as a means of hunting down “illegal infiltrators—Alia, Malia, Jamalia who kept entering from Pakistan”, deliberately glossing over the fact that many of those left out are Hindus. The only pocket which has welcomed the Citizenship Bill is Assam’s Barak Valley, where Bengali-speaking Hindus dominate. Not surprisingly, the prime minister made these remarks in the Barak Valley. For many years after Partition, we had more Muslims in India than there were in Pakistan, which had been created as a Muslim homeland. As a child of parents forced by Partition to migrate from their birthplace, I felt proud that the country I had been born in had proved the two-nation theory wrong. In India, where it was difficult to accept that the country had been divided into two separate nations, atonement for the tragedy could have been done by ensuring two things. First, those who were forced to migrate to Pakistan should have been free to visit their birthplaces, their family members who had chosen to stay back, as well their childhood friends with whom they shared history, language and culture. They should also have been free to return to their birthplace forever. Alas! This didn’t continue after the initial years of Partition. Getting permission to visit relatives became a traumatic experience. This writer remembers watching old Sindhi women fall at the feet of Pakistani visa officers when temporary visa offices used to open in Mumbai in the 80s, crying for a last chance to see a sibling left behind in Sindh. The hordes of desperate visa aspirants inside and outside these offices (some would climb over the high compound wall to avoid getting crushed) exemplified the PM’s two questions quoted above. But will the prime minister accept that his two questions must apply to both countries and both communities equally? Shouldn’t Indian officers handling visa requests from Pakistani Muslims who migrated from India treat these as attempts to re-establish “connection with Ma Bharati”? Shouldn’t calls and visits by Indian Muslims to Pakistan, where many of their blood relations reside, stop being viewed suspiciously by the police? Apart from easy border crossings, the second atonement for Partition would have been to ensure that Muslims, reduced to a vulnerable minority by the exodus of their co-religionists,were protected from bullying by the majority. Instead, the “hopes and aspirations’’ of many of these Muslims who had stayed back “for the love of their land and home” were “crushed” as brutally as were the hopes of many of the Hindus across the border who had chosen not to migrate. But the PM’s version of atonement for the “mistakes of Partition” is quite different. It lies in the Citizenship Bill. If welcoming Hindus from Bangladesh with citizenship amounts to righting the wrongs of Partition, then the “mistake of Partition” must lie in the decision to stay back, made by those who believed the promises of leaders. Taken to its logical end, this reasoning would mean that all Hindus and Muslims should have chosen to migrate to the country of their religion. Partition should have seen a full exchange of religious populations.But this religious cleansing would have gone against the basic premise on which independent India was envisaged, by those who fought for its freedom. India was not imagined as a land for Hindus alone. Bringing this exchange of populations to fruition today, by granting citizenship to Bangladeshi Hindus, but throwing out the “Alia, Malia, Jamalia who kept entering from Pakistan”, and constantly telling Muslims to go to Pakistan, is not atonement for the mistake of Partition. It’s validating its basic premise. But the BJP’s precursors did not participate in the fight for freedom, so they wouldn’t know this.